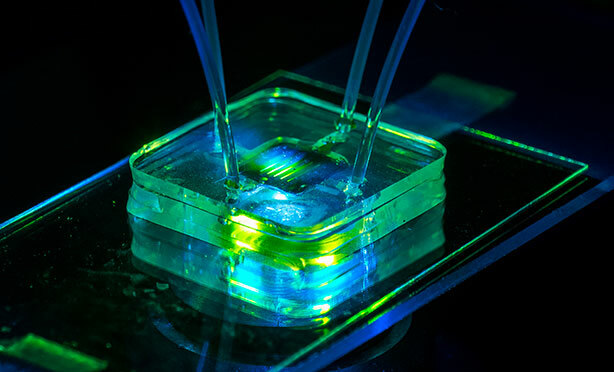 A microfluidic bioreactor consists of two chambers separated by a nanoporous silicon membrane. It allows for flow-based assays using minimal amounts of reagent. The ultra-thin silicon membrane provides an excellent mimic of biological barrier properties. NOTE: This image combines two exposures in order to capture the brighter and darker parts of the scene, which exceed the dynamic range of the camera sensor. The resulting composite is truer to what the eye actually sees. The ability to shrink laboratory-scale processes to automated chip-sized systems would revolutionize biotechnology and medicine. For example, inexpensive and highly portable devices that process blood samples to detect biological agents such as anthrax are needed by the U.S. military and for homeland security efforts. One of the challenges of “lab-on-a-chip” technology is the need for miniaturized pumps to move solutions through micro-channels. Electroosmotic pumps (EOPs), devices in which fluids appear to magically move through porous media in the presence of an electric field, are ideal because they can be readily miniaturized. EOPs however, require bulky, external power sources, which defeats the concept of portability. But a super-thin silicon membrane developed at the University of Rochester could now make it possible to drastically shrink the power source, paving the way for diagnostic devices the size of a credit card.